CodeXL is now open source! CodeXL is now part of the GPUOpen initiative. You can find all of CodeXL’s source code (barring a few parts that are IP-confidential) on the CodeXL GitHub project. Version 2.0 is also available in pre-built binary form, like previous versions. We believe that by adopting the open-source model and sharing the CodeXL source base with the world we can help developers make better use of CodeXL and make CodeXL a better tool. Below are the major new features in this release. A new mode has been introduced into CodeXL 2.0 – Frame Analysis Mode. This new component, currently released in Beta stage, is aimed towards developers focused on game development. With it, you can capture a render frame from a Microsoft® DirectX® 12 application, and view its render timeline and CPU and GPU execution block details. Host code debugging is now supported in the Visual Studio® extension (32-bit native C/C++ code only) and Linux® version of CodeXL. 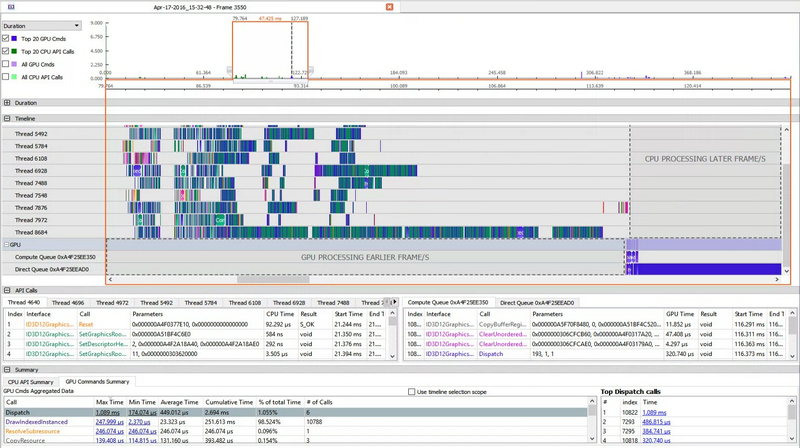 This new feature upgrades CodeXL from an API-level debugger to a full-fledged debugger on the host (CPU) side – including source code breakpoints, application stepping, locals and watch expression evaluation, while retaining the OpenCL kernel debugging capabilities in the same debug session! 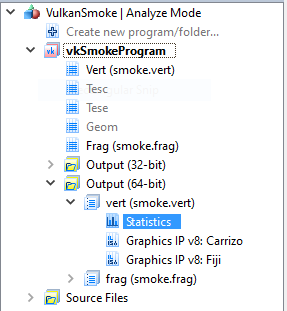 Analyze Mode now features support for Vulkan™ GLSL shaders, including ISA generation and performance statistics. Also new in this version is support for GLSL programs (both OpenGL® and Vulkan shaders). Combine your shaders to be linked in a complete program, providing more accurate ISA and performance statistics. CodeXL 2.0’s Power Profiling mode includes the long-awaited feature of attributing samples to specific processes, allowing you to not only know when power is used by the system, but also by whom! CodeXL HSA Profiler and HSAIL Kernel Debugger now support the Boltzmann initiative driver, on AMD Radeon™ R9 Fury, Fury X and Fury Nano GPUs (codenamed “Fiji”), and 6th Generation AMD A-series APU processors (codenamed “Carrizo”). Join us in CodeXL development and enjoy the release! Ashes of the Singularity images courtesy of Oxide Games. OpenCL is a trademark of Apple Inc. used by permission by Khronos. OpenGL is a registered trademark of Silicon Graphics, Inc. in the United States and/or other countries worldwide. Microsoft, Windows, DirectX and Visual Studio are registered trademarks of Microsoft Corporation in the United States and/or other jurisdictions. Vulkan is a registered trademark of Khronos Group Inc. in the United States and/or other jurisdictions. Linux is the registered trademark of Linus Torvalds in the United States and/or other jurisdictions. Doron Ofek is a Senior Manager at AMD Developer Tools group and the development lead for the CodeXL tool suite since its first release in 2012. Doron has over 20 year of development experience. Prior to joining AMD Doron worked on SW projects for the Defense, Print, and Semi-conductor industries. Out of office he enjoys hiking, cooking, Tai-Chi and Pilates. Links to third party sites, and references to third party trademarks, are provided for convenience and illustrative purposes only. Unless explicitly stated, AMD is not responsible for the contents of such links, and no third party endorsement of AMD or any of its products is implied. 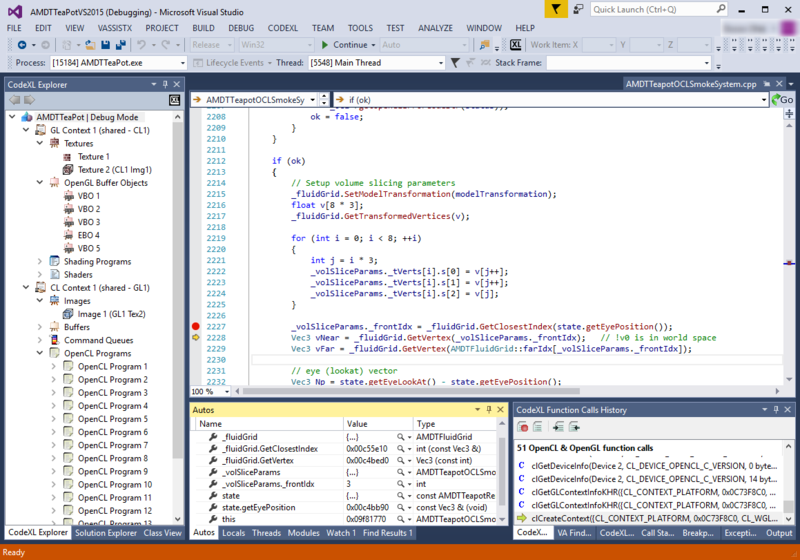 cause vs2013 update2 crash while start debug mode. I’ll reply on the GitHub issue page. Amazon server is blocked here in China. Only source code can be downloaded with incredibly low speed. The binaries for Windows and Linux are in the Releases section on the CodeXL Github project page. can i hope for possibility to set custom fonts will be used in interface? some default fonts look ugly on my PC.